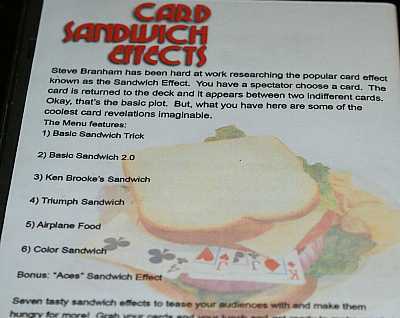 This DVD is a good BEGINNING introduction to the sandwich effect menu. The effects and methods taught are excellent for a beginning card worker, as they use no (or only simple) sleight of hand. But the effects are all interesting card reveals for lay audiences. The methods are clearly taught, though Branham's performances are (in my opinion) sloppy. But it does give you a good chance to see how NOT to get a break under the top card, or hold a break for a double-under cut. So learn the tricks from the DVD, but take more time to practice and correctly perform them. This DVD normally sells for $14.95 but I got a few at a good price (and $14.95 is too much for it), so get it from TMGS for less!